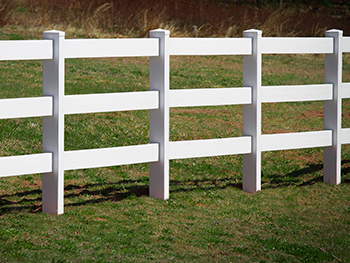 If a classic, open, natural-looking CT fence is what you're looking for, then post and rail CT fencing is a great solution. 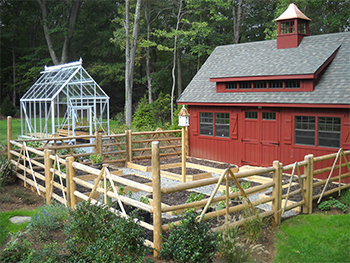 An adaptation of the zigzagging, early American split rail fence, post and rail offers the same rustic look that lends itself to any landscape. It's also one of the easiest fences to build. 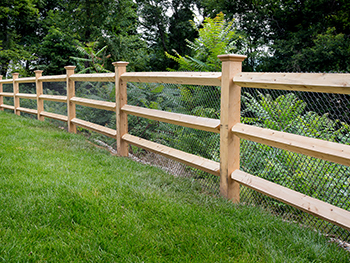 Cedar Round Rail - This classic style fence combines an open view with exceptional sturdiness. Northern white cedar round rail comes in either a dowled style or a scarfed "paddle end" style. With it's smooth round finish it is easy to a add a wire mesh to the fence for containment of pets or children. Western Red Split Rail - Western Red Cedar split rail is the perfect style if you want a rustic, organic look. This aromatic Western Red Cedar fence is naturally resistant to insects and decay. Available in either a two or three rail design. Locust Split Rail - West Virginia Split rail in either two or three rail design. A true Appalachian look in a mix of locust and white oak. Wood Guard Rail - Traditional safety system for parking lots, parks, golf courses etc. Diamond Estate Rail - This beautiful style post and rail has a finished New England style that is unmatched by no other. Contemporary diamond rail offers a unique alternative to the traditional post and rail fence, shifting the position of the rails to create a diamond-shaped effect. If you’re looking for an attractive, elegant fencing solution, this is it. Post and Wire - Simple and functional. Post and wire is a great solution to contain a yard or even protect a pool if you are looking for a solution that will blend in with surroundings.